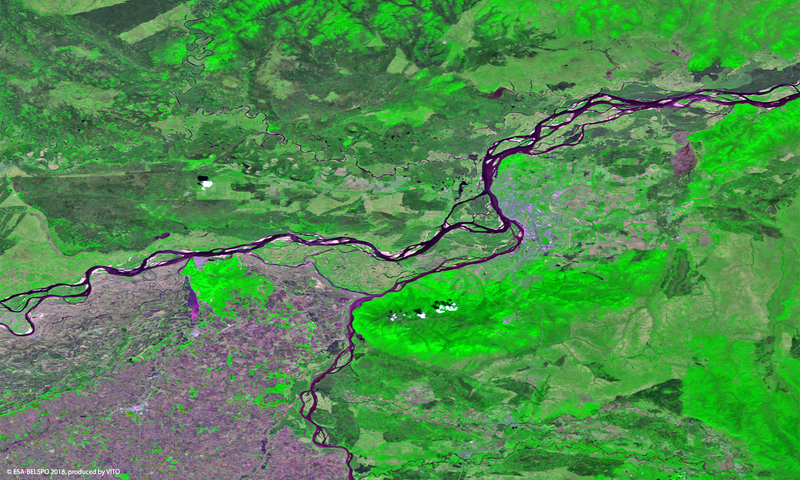 Together with the Ussuri River, the Amur River, tenth longest in the world, forms part of the border between the Russian Far East and northeastern China, until their confluence near Khadarovsk (highlighted in bright purple spots in this mid-May image). After that, the river continues its way to the northeast, spreading out into a braided character as it passes through a wide valley. The Heilong Jiang province of China, on the south bank, and the Amur Oblast in Russia on the north side, are both named after the river, which continues to play an important geo-political role. The “Black River” or “Black Dragon River”, after the local historical Manchu name and current Chinese name of the river, is the only river in the world where subtropical Asian fish, such as snakehead, coexist with Arctic Siberian fish such as pike. The largest species is the kaluga, that can attain an astounding 5.6m in length.